I was a naysayer of this series in several of my Potter reviews citing the dullness of the three leads and their lack of character development. The plotting seemed to ramp up in the last four movies, which created confusion for those who didn’t care to keep up. This, of course, is my fault. But this time I watched all the previous films over the course of a couple of weeks before completing the franchise. 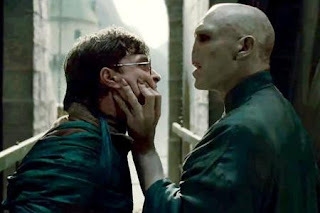 Miraculously, in the final episode, Potter pulls out its best film by connecting the dots from the course of the series resulting in a truly satisfying and emotional conclusion. When we last left Potter and his pals they were looking for the ‘horcruxes’, trinkets through which Voldemort had transformed his soul during that historic battle with Harry’s mother and father and left Potter with the lightning bolt scar. These horcruxes become the mission du jour, the destruction of which will eventually defeat the dark lord. Meanwhile, Voldemort has found the 'elder wand', which is all-powerful and certainly no match for Potter. As Voldemort assembles his army, the wizards at Hogwarts are fortifying the castle with a force field of sorts, ready for the eventual siege. The siege on Hogwarts is exciting, rendered with creative and well designed special effects. And while the action is fast and furious, Harry’s search for the final horcrux located in Hogwarts forces him to finally come face to face with his destiny. The dramatic guts of the entire series lay in a remarkable and revelatory sequence, which traces the connection of Severus Snape, Dumbledore and Potter himself. It’s a 20-year journey that affects the decisions of Potter in the present. This is the stuff of great epic storytelling and David Yates and company execute these key reveals with maximum dramatic impact. A secret is revealed, which admittedly I guessed in the last film. However, the best twists are not the sudden or arbitrary reversals of fortune but rather the reactions of the characters to these twists of fate. With that said, the filmmakers also commit a diabolical CHEAT. SPOILER ALERT…As implied above, we come to learn that Harry himself is a horcrux. In the back of our minds (and Harry’s) we expected this. And when this information is revealed it is still a shocker, as Harry must die to save the world. What a dramatic decision to make. And indeed Harry makes that decision and sacrifices his life. Yet when Harry’s death is revealed to Hermione and the other Hogwarts wizards, he comes back to life. WHAT? I’m sure there was a magical explanation for this somewhere, but it’s a cheap bait-and-switch tactic that betrays the build-up before it. It’s a blip that prevents this film from becoming great and marking itself with cinematic perfection. Oh, how close the filmmakers came to that. Nonetheless, it’s still the most successful franchise in the history of cinema, so no one other than me seems to care. Harry Potter and the Deathly Hallows Part 2 is available on Blu-ray from Warner Home Entertainment. Your review of Harry Potter was right on, I enjoyed reading it. If you are into movies with a lot of depth and some intense action, then Harry Potter and the Deathly Hallows is a movie you need to see if you haven’t seen it already. One way you can see it is by using the new Blockbuster Movie Pass. Right now if you switch to DISH Network you can get Blockbuster Online FREE for 3 months! There are over 100,000 titles to choose from. As a DISH Network customer and employee I can tell you that if you’re in the mood for movies not in your queue, that’s no problem! You can get a different title right now with instant in-store exchanges.